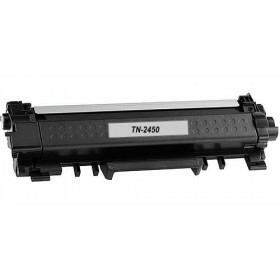 Our new Brother TN-2450 Generic Toner represents great value. Simply install and print exactly the same as the genuine Brother toner. Our Premium toner range are super reliable and come with an unconditional 60 Day Money Back Guarantee. Don't settle for a low grade refilled toner just to save a few dollars. We guarantee the print quality of our Premium toner range as they are not a remanufactured toner that has just been refilled, they are BRAND NEW toners, every last component. Who wants to be bothered buying a generic toner that needs a chip replaced from an old toner. Our toners have the chip already fitted so there is no messing around. Yes that's right just install and print! Our Brother TN 2450 Generic toners are guaranteed to do 3,000 pages just the same as the more expensive brother brand name toner. The Brother TN 2450 is compatible with the following printers: HL L2350DW, HL L2375DW, HL L2395DW, MFC L2710DW, MFC L2713DW, MFC L2730DW, MFC L2750DW. Ink Hub also offers a full range of generic drum units to fit all of these Brother printers. The Brother Mono Laser printers are very reliable and ideal for home or small business use. When will my Brother TN 2450 Toner be delivered? All of our Compatible Toners are Delivered throughout Australia by EXPRESS Aust Post. We are more than happy to deliver to PO Boxes and all of our deliveries are trackable. Most orders arrive within 24 hours. Remote areas can take up to several days. Delivery Fees are a standard $5-50 inc GST. All orders totalling over $65-00 are delivered FREE of charge. All orders placed before 3.00pm Adelaide time will be posted the same day.